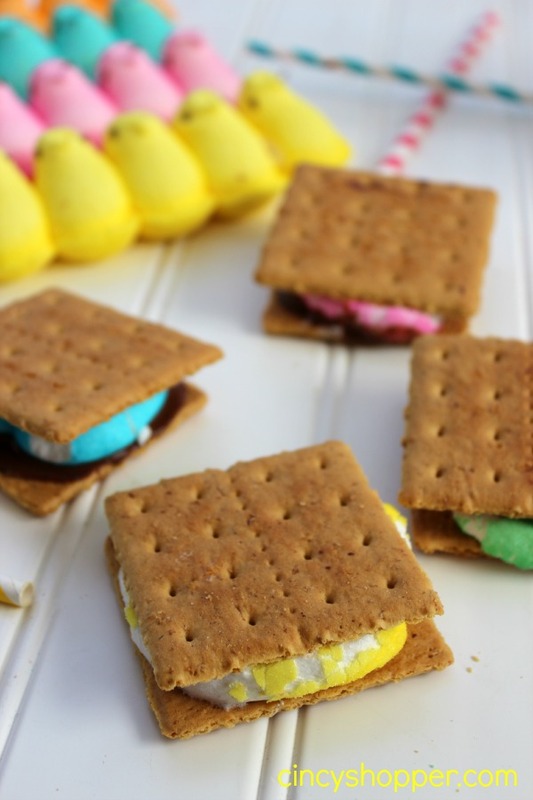 These PEEPS S’Mores treats are so yummy that the kiddos have consumed every single peep in the house. I have mentioned that PEEPS are a favorite in our household when I posted the Chocolate Covered PEEPS I made for the kids Easter Baskets. I had purchased a ton of different colored PEEPS for some crafts that I was wanting to do for Easter. 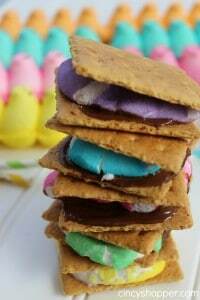 I decided I would make the kids some yummy PEEPS S’mores this weekend for a treat. BIG MISTAKE! Ha ha. They have ate all of my PEEPS. Luckily Remke and Kroger both have a large assortment of colors for me to grab some more for my crafts, lol. 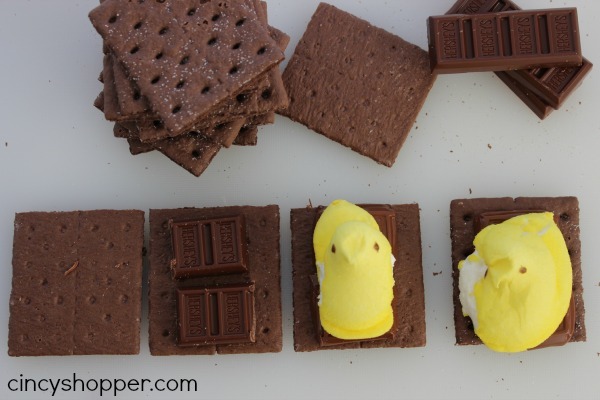 PEEPS S’mores are so simple. Made just like indoor microwave s’mores except you use PEEPS. So simple and and so quick to toss a gooey and yummy afternoon treat together. We had both chocolate and regular graham crackers. 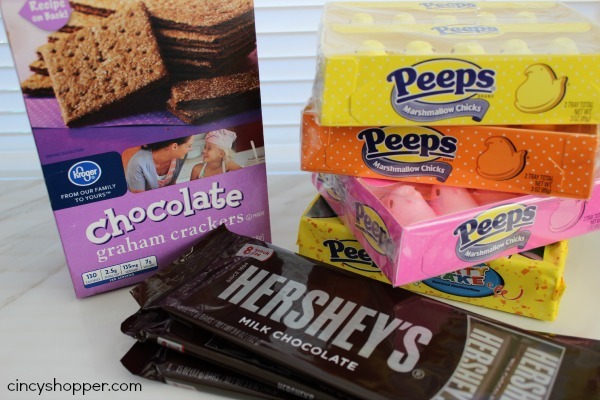 Traditional graham crackers were my favorite and chocolate of course were the kiddos favorite. 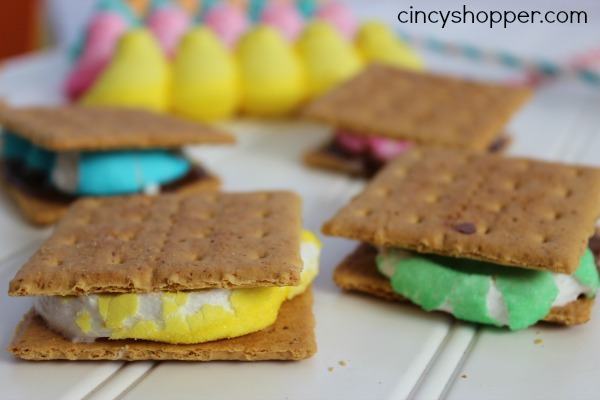 If you are looking for other great Easter Ideas be sure to check out the Easter Chick Deviled Eggs, Nutter Butter Chicks, Reese’s Peanut Butter Eggs Coconut Cream Eggs, Coconut Birds Nests Cupcakes, Easter Egg Cake Bites and the Chocolate Covered Peeps that I have shared this past week. I will be sharing some great recipes and DIY Crafts for all of your Easter Holiday needs in the next few weeks. Place immediately on top of graham cracker with softened chocolate and top with another graham cracker, pressing together lightly. I use chocolate cake icing for my smores. Less mess, super easy and delish!